About a year ago, I attended the Ting Tings concert at Webster Hall in NYC. It was one of my first concerts in NY and I had just started my exploration of the concert venues in NY, which I am still continuing to do. While waiting for the Ting Tings to perform, “Hang Me Up to Dry” by the Cold War Kids played and I loved it immediately. I like the feistiness and sexiness of the lyrics and melody of the song. I am still hoping to catch the Cold War Kids in concert soon. Let me know if you hear of any concert murmurings around the NY area. After hearing this song, I have found many of their other songs that I quite enjoy. Hope you do too! 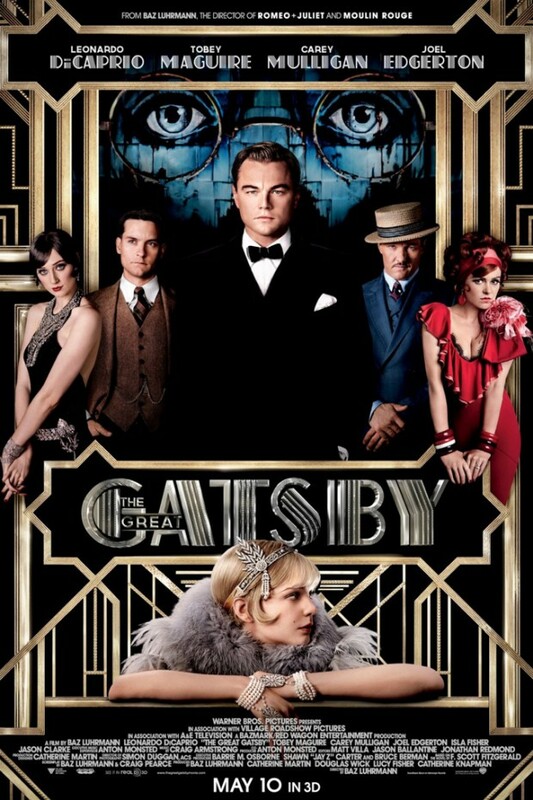 I am beyond thrilled for the new Baz Luhrmann film, The Great Gatsby, to be released in theatres on May 10th. If you have not seen a trailer yet, please check out the video below and get ready for sensory overload. i can keep watching these trailers over and over again. 1) Baz Luhrmann is the Director – Baz is known for his great Red Curtain Trilogy, which included Strictly Ballroom, Romeo + Juliet, and Moulin Rouge. Let me tell ya, I loved all of these films, especially the bright splashes of color, use of shadows/light and random quick moments of silliness. 2) The Great Gatsby by F. Scott Fitzgerald is a quick-read in which many of us have forgotten since reading it in high school. I recently re-read the book and I quite enjoyed it. Make sure you give it another go before seeing the film! 3) The costumes – Catherine Martin collaborated with Miuccia Prada to create the costumes for this film, which focuses on high fashion of the 1920s. Lots of crystals, flowing chiffon, rhinestones, tassles and those fabulously sharp bob hairdos. 4) Leonardo DiCaprio. I haven’t found a project with Leonardo DiCaprio that I haven’t liked yet (including Growing Pains). Check out clips of the rest of the songs on the soundtrack here. Hope you enjoy and let me know if you’re excited for May 10th too! This week’s MMJotW ” is inspired by feeling good and grooving to music like nobody’s watching. I loved this song the moment I heard it especially since I’ve always been a fan of Robin Thicke and Pharrell. This song reminds me of Marvin Gaye’s jam “Got To Give It Up,” which is an awesome feel-good song and an all-time classic jam to groove to. Enjoy the jam and feel good this week! Hey hey hey!